Why Is Promotional Merchandise So Important? Branded Products, So Hot Right Now! The world we live in today is full of logos and messages that companies want to get across to existing clients and prospects to help promote; ensuring these brands continue to be successful. According to The Business Dictionary, promotional products can be defined as an item that is "given away to current or prospective customer... usually carry the name and address of the firm, as well as information on the products and services, and serve as reminders. Also called advertising novelty or advertising specialty". When we talk about promotional items, these can simply be a promotional pen, a branded mug that reminds customers of you every time they have a cuppa, to high-end gadgets such as personalised power banks so that your client will never run out of charge. Branded items come in many sizes, shapes and colours from an everyday keyring to fully bespoke items allowing you to tailor your promotional merchandise to be more specific to your current marketing campaigns and events. The promotional merchandise industry continues to grow significantly, with 2017 taking the industry past the billion-pound mark in the UK (Sourcing City Market Report 2017). All successful organisations back up their branding with great promotional items to keep raising their profile, spreading their message and ensuring their business stays current. Research Conducted at Marketing Week Live (2017) found that 58% of marketers would spend more money on promotional merchandise if they had the budget available to do so, and over 10% of these are spending in excess of £50,000 per year on promotional products; highlighting the value they see in them. How Can Promotional Items Help Your Business? Superb business exposure - encourage your customers and employees to become walking, talking brand advocates as they carry around your promotional merchandise every day helping to increase brand awareness. Promotes customer loyalty - people love to receive gifts, so demonstrate your appreciation to your customers to ensure they stay loyal. Is the best business card in effect by far – having your logo on promotional giveaways, on show to world can really create a buzz and increase ‘word of mouth’ marketing for your brand. Can suit any budget – Whether you or your client have a small or large limit on what you can spend on branded items, there are many inexpensive giveaways, as well as a huge range of high-end promotional products. Compliments other marketing methods – it is important to have an integrated marketing campaign that involves not just advertising, print and online marketing but also tangible promotions to maximise the effects and get your message out there. The 4 R's of promotional products help to reiterate the key benefits: 88% of customers able to Recall the brand on a promo gift; positive effects on Reputation with 59% having a more favourable view of the brand; excellent Retention rates with 47% keeping items for a year or more; and a higher performing ROI than other advertising platforms. In this day and age every business should invest in branded gifts or giveaways for their clients as this incentive can often help increase sales and even create fresh new leads. So maybe at your next event or exhibition look into ordering some fun and quirky promotional items. People will remember your name and branding, helping to raise your profile and aid other marketing strategies. To be honest who does not like a freebie, we know we do! How Long Do People Keep Promotional Gifts For? 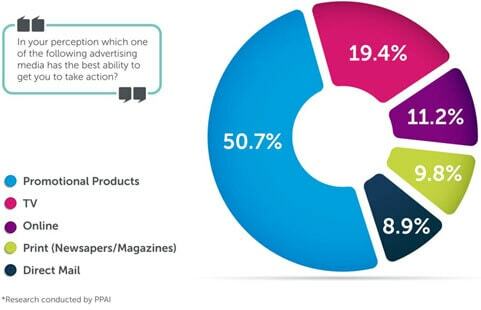 This is a very good question and the chart below gives us a good indication (PPAI 2016), with promotional products being kept on average for almost 3 years. This is far more publicity than other marketing methods, for example TV advertising which, depending on the budget, often has a fairly short lifespan and is a very costly advertising medium. Research has found that second screen users (individuals using a smartphone or tablet while watching TV) only managed to recall 1.62 out of every three brands mentioned in TV ads, having significantly negative effects on the impact of this medium in recent years (Advanced Television 2015). The pie chart below is great for demonstrating the benefits of promotional products in comparison to other marketing mediums, particularly when these are used effectively with a call-to-action, encouraging users to pick up the phone and call you! Why Do People Keep Promotional Giveaways? Here are the top 10 reasons why recipients own Promotional Products (PPAI 2016). 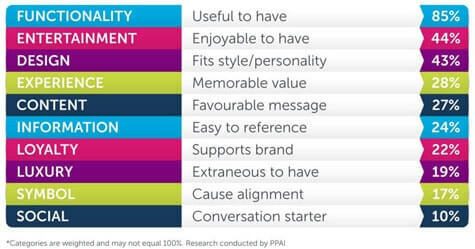 As you can see, functionality scored the highest with 85% of respondents keeping promotional merchandise that is 'useful to have'. This demonstrates how important it is in the planning stages of a promotional marketing campaign to always think about practicality when it comes to your customers. Some of our most popular functional promo gifts include pens, mugs, umbrellas, torches and power banks. At the same time, there is no harm in having some fun; 44% of respondents keep branded giveaways because they are enjoyable to have - this proves that novelty items are also a great way to keep customers amused and entertained! Think about what your customers’ specific needs are and research what promotional items your competitors are using. Think about how customers would use the product; contemplate the size, colour, what branding is appropriate as well as any variations in costs. Do you plan to use the promotional product as a free giveaway for customers or do you plan to sell your branded merchandise on your online store? Anticipate how many sales you are likely to make and what profits you would make from one sale. What prices do your competitors charge for their branded merch and are they likely to change their pricing after you have launched your merchandise? If you are using your promo goods as a free gift incentive, then think about where and how you are going to distribute them. Will your top customers have easy access? Will you send out the gifts in a direct mail campaign? If you are going to sell your merchandise, think about where your customers are located and where they make their purchasing decisions. Consider different sales and distribution channels. What is the new promotional merchandise going to be promoting and how are you going to communicate this? Is it an event or a brand message you want to raise awareness about? How have your customers responded to your previous marketing campaigns? Will you be using social media and other platforms alongside your promotional products to gain further exposure? Plan your HR strategy, contemplating what each individual in your organisation is going to be responsible for. What experience and skills can you utilise, will staff need any training? Think about how you will motivate and reward employees for performance achievements. Think about the operational processes required, is your company ISO9001 quality certified? What procedures are in place for ensuring the campaign runs smoothly and efficiently? Do you need to carry out a risk assessment? There are signs everywhere and we don’t mean just the ones on advertising billboards. Everywhere you look there are company names and logos which are then fixated into our brains. Who doesn't know what the golden arches are? See, got you thinking! Are we right? So whether you have a tiny or huge marketing budget, the word on the street is that yes branded promotional products are very important. As the great English proverb goes “From little acorns do mighty oaks grow”. Copyright © 2019 Premier Promotional Products. All rights reserved.